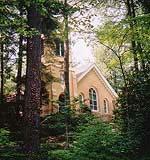 Historic St. John in the Wilderness Episcopal ChurchWelcome to Historic Flat Rock, Inc. We are a nonprofit organization dedicated to preserving our area's heritage for future generations. Our sole purpose is to preserve historic homes, views and land in the Village of Flat Rock and surrounding area. We want to protect the Village from unwise development and enhance the beauty that is here through historic preservation. Flat Rock is located in the beautiful Western North Carolina mountains 3 miles south of Hendersonville, NC. Flat Rock dates back to a time when the Cherokee met on the great flat rock which is still visible today. Flat Rock was established about 1807. However, the settlement that was to become the "Little Charleston of the Mountains" really began to grow in 1827 when Charles and Susan Baring built their summer home and private chapel. Soon friends followed. Before long, quite a colony was formed. In the late 60's, the North Carolina Department of Archives and History surveyed the Flat Rock area. As a result, the Flat Rock District is now included in the National Register of Historic Places. The entire village is a treasure trove of historic architectural elements. Historic Flat Rock, Inc. was established in 1968. Since then it has been instrumental in the preservation and restoration of properties of note. It has obtained numerous preservation easements on historic properties through the cooperation and generosity of the owners. Many thanks to all those whose efforts will help preserve Flat Rock now and for future generations. Please think of us first in connection with preservation. To protect and preserve, in the community of Flat Rock in Henderson County, NC, such landmarks (including but not limited to public buildings, churches, houses, woodlands and open spaces) as are or may be of historical, architectural, cultural or recreational value to the community, state, and nation. To solicit funds with which to purchase property described in paragraph (a) for purposes of protection or preservation; to dispose of such property through sale to individuals, corporations, or institutions.